Newly created off-street parking now makes this home ideal in location and convenience in addition to being a home with extraordinary architectural character. Grab a coffee. Catch a movie. Attend a lecture on campus. 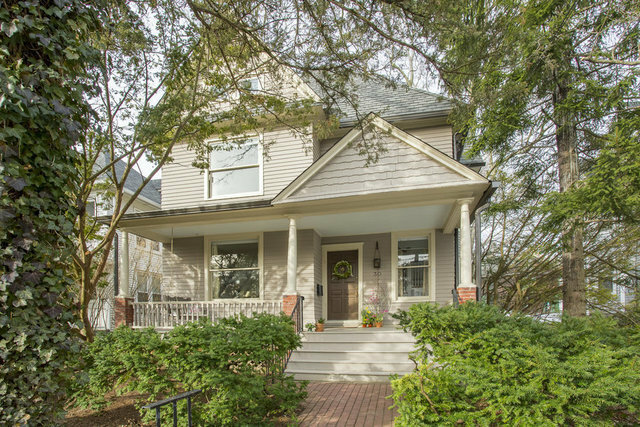 All of this and so much more are at the doorstep of this turn-of-the-century Queen Anne. A deep yard and the autonomy of a free-standing home are rarities in this high-demand, heart-of-town location. Although many interior improvements are obvious, the preservation of period details and architectural integrity were top priorities and it shows when you open the original dutch door. Wood floors, French doors and the delicate spindles of a pretty staircase greet you in the foyer. A window seat and built-ins frame oversized panes of wavy glass in the double parlor and a windowed bay mirrors the one in the adjoining dining room. The newly renovated kitchen with white painted cabinetry, gray toned granite countertops, and ship-lap wall is large and bright with sliders to a sundeck above the beautifully landscaped fenced yard. Two staircases climb to four bedrooms and two new bathrooms, one with a soaking tub and one with a European-style shower. The attic level with a peaked ceiling and a trio of rooms is a glorious getaway for an artist and anyone working from home.